The Motorola SE-2000 digital video encoder provides Motorola’s sixth generation video compression technology in a compact chassis that is ideally suited for the cable head end, small broadcast and high bandwidth contribution applications. The SE-2000 digital encoder accepts either analog composite or digital CCIR-601 video and performs MPEG-2 compression utilizing Motorola’s new PurePixel™ processing algorithms, providing very high video quality at low bit rates. Video compression uses I-frame refresh to facilitate seamless MPEG-2 stream splicing. The video compression data rate is controlled by a simple front panel interface or through the Ethernet port via SNMP. Two stereo audio channels are compressed with either Dolby® brand AC-3® or MPEG layer II encoding. The Motorola SE-2000 provides three types of outputs, DVB-ASI, digital head end expansion interface (DHEI) and DS-3, for easy interoperability with cable head ends and broadcast equipment. The Motorola SE-2000 is MPEG-2 and DVB compliant. The Motorola SE-1010 digital video encoder provides Motorola’s fifth generation video compression technology in a compact chassis that is ideally suited for the cable headend and small broadcast applications. The SE-1010 digital encoder accepts either analog composite or digital CCIR-601 video. Video compression uses I-frame refresh to facilitate seamless MPEG-2 stream splicing. The video compression data rate is controlled by a simple front panel interface or through the Ethernet port via SNMP. Two stereo audio channels are compressed with either Dolby® brand AC-3® or MPEG layer II encoding. The Motorola SE-1010 provides three types of outputs, DVB-ASI, digital headend expansion interface (DHEI) and DS-3, for easy interoperability with cable headends and broadcast equipment. The Motorola SE-1010 is MPEG-2 and DVB compliant. 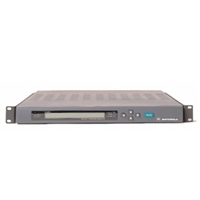 The Motorola Digital Video Encoder, model SE-1000, provides Motorola's fifth generation video compression technology in a compact chassis that is ideally suited for the cable headend and small broadcast applications. Model SE-1000 accepts either analog composite or digital CCIR-601 video and performs MPEG-2 compression using highly refined Motorola compression techniques that provide high video quality at low bit rates. Video compression uses I-frame refresh to facilitate seamless MPEG- 2 stream splicing. The video compression data rate is controlled by a simple front panel interface with pre-set configurations. Two stereo audio channels are compressed with either Dolby® brand AC-3 or MPEG layer II audio coding. Data services for PSIP insertion or other applications are combined with the compressed audio and video to form a transport stream. The Motorola SE-1000 provides three types of outputs, DVB-ASI, digital headend expansion interface (DHEI), and DS-3, for easy interoperability with cable headends and broadcast equipment. The Motorola SE-1000 is ATSC and DVB compliant. The SmartStream interactive digital cable system consists of an integrated set of high performance stream processing elements necessary for the successful deployment of advanced services like VOD and digital ad insertion. To accommodate various deployment strategies and network architectures, the elements of the SmartStream system have been designed to: simplify and optimize the management of headend system resources; affordably address exploding stream count; provide a secure content delivery environment; and provide a scalable architecture to allow the system to grow with subscriber additions. The SmartStream system has been designed specifically to address the next wave of revenue producing services being readied by the cable industry. The enhanced viewing experience that these new services bring to consumers requires sophisticated and powerful headend-resident systems to efficiently process thousands of content streams and manage the cable plant bandwidth. The SmartStream system overlays and adds functionality to existing digital cable systems and adds four new product families to optimize advanced services performance. Motorola’s OmniStar GX2-LM1000E Series 1310 nm Broadcast Transmitter uses a high-power DFB laser, an integrated low-noise preamp, and state-of-the-art predistortion and anticlipping circuitry for superior performance. The compact, energy-efficient design allows up to 16 plug-and-play transmitter modules to operate in the 4 RU OmniStar GX2 housing, maximizing valuable headend space. 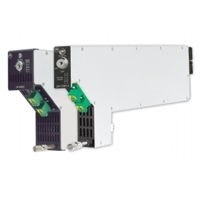 Enhanced with PowerPC technology, LM1000E series transmitters introduce intelligence to traditional headend equipment. Hot-swappable modules with Quick-Swap Module Configuration maximize in-service time by eliminating the need for manual configuration. The wide range of optical output power is coupled with the full complement of other OmniStar GX2 application modules, providing extreme flexibility for network design and fiber link optimization. OmniStar GX2 is a fiber optic broadband transmission platform designed for the Broadband Hybrid Fiber/Coax Networks of tomorrow. The OmniStar GX2 provides increased module density, while continuing the OmniStar legacy of scalability, performance, and flexibility. The four rack-unit chassis accepts up to 16 Plug-n-Play application modules, minimizing headend space requirements. 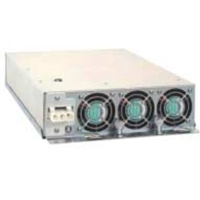 A two rack-unit mini-chassis is also available that holds three application modules. With superior 1310 nm and 1550 nm products, the OmniStar GX2 enables you to offer more revenue-generating services. The universal platform and full complement of application modules can accommodate any system architecture. Enhanced with PowerPC® technology provided by Motorola, this next generation broadband platform brings newfound intelligence to traditional headend equipment. The high-performance chip, used in today’s luxury automobiles to enable in-car networking, is the foundation of this denser, smarter, and moreefficient design. The OmniStar® GX2-EM870 series of 1550 nm Broadcast Transmitters uses advanced optical linearization technology to provide low noise and superior distortion performance. The suite of products satisfies various applications: full band loading or split band loading, super-trunking or distribution to nodes, long-distance transport or short hops. Several different versions of the transmitter are available that are optimized for transmission system standards with 6 MHz, 7 MHz, and 8 MHz video channels. A proprietary technique provides Stimulated Brillouin Scattering (SBS) suppression up to 16 dBm to enable long links when used in conjunction with optical amplifiers. The transmitter uses a 1550 nm DFB laser diode as a precision light source, which is modulated by an optically linearized Mach-Zehnder modulator. Use of external modulation technology eliminates laser chirp and allows designs of transport systems for distances well beyond 100 kilometers. Enhanced with PowerPC® technology, the GX2-EM870 series introduces a new found intelligence to traditional headend equipment. The system performance is continuously monitored and a sophisticated control algorithm assures optimum performance. The OmniStar® GX2-EM1000 series of 1550 nm Broadcast Transmitters uses advanced optical linearization technology to provide low noise and superior distortion performance. The suite of products satisfies various applications: full band loading or split band loading, super-trunking or distribution to nodes, long-distance transport or short hops. Several different versions of the transmitter are available that are optimized for transmission system standards with 6 MHz, 7 MHz, and 8 MHz video channels. Enhanced with PowerPC® technology, the GX2-EM1000 series introduces a new found intelligence to traditional headend equipment. The system performance is continuously monitored and a sophisticated control algorithm assures optimum performance. modes can satisfy a wide range of system design requirements: Constant Output Power mode to maintain exact optical levels; Constant Pump Power mode to optimize noise figures; and Constant Gain mode for DWDM applications. 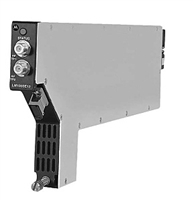 The GX2-OA100B Series Optical Amplifiers employ a proprietary erbium-doped fiber formulation that provides low noise performance, along with the most reliable 980 nm pump lasers available in the industry. Other user benefits offered as part of the OmniStar GX2 platform include: higher density, SNMP interface for network management, and Quick-Swap module capability. With two independent receivers in the module, the OmniStar GX2-RX200BX2 return path receiver module provides a high-density solution for advanced upstream video and data traffic. The wide optical input power range can accommodate today’s evolving networks with varying link budgets. An integrated low-noise pre-amplifier and high-performance post-amplifier offers high RF output level and exceptional distortion performance. Enhanced with PowerPC technology by Motorola, these receivers introduce a new found intelligence to traditional headend equipment. The hot-swappable modules with unique embedded features, like Quick-Swap Module Configuration, maximize in-service time by eliminating the need for manual configuration. This receiver, coupled with the full complement of other OmniStar GX2 application modules, provides extreme flexibility for network design and fiber link optimization. The GX2-PSAC and GX2-PSDC modules are installed in the rear of the Omnistar GX2 Housing (GX2-HSG) where power connections are easily made. Integrated fans provide localized cooling. A tri-colored LED on the rear of the unit indicates operating status. An additional tri-colored status LED is provided for each power supply on the front of the Control Module (GX2-CM100B). Though on ower supply can power an entire housing, the GX2-HSG accommodates two power supplies for true power source redundancy. 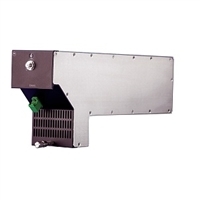 When two power supplies are used, the load is shared between both supplies. If one supply fails, the other immediately picks up the additional load. For increased flexibility, the second power supply can be either AC or DC depending on system needs. 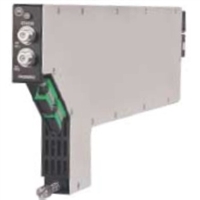 The GX2-CM100B control module supervises all the application modules and power supplies within the housing while also serving as the communication gateway between the modules and the various user interfaces. Three tri-colored LEDs are located on the front panel of the module: one indicates the worst-case status for all application modules and the other two indicate the status of the power supplies. The front panel Ethernet port allows local control and monitoring of all modules through a Web browser-style interface on a PC. The rear Ethernet port can be used for SNMP communications with a network management system. Although the application modules can operate without it, the control module is necessary to setup and monitor modules through either the display option on the shelf door or the Web browser-style interface. The control module also enables some of the advanced OmniStar GX2 features such as Quick-Swap Module Configuration and downloadable firmware. The Motorola DSR-4520X is the new advanced featured DigiCipher® II integrated receiver/decoder (IRD). The Motorola DSR-4520X digital satellite receiver is designed for cable operators and other commercial satellite operations who want to maintain their signal in a digital format. Incorporating multiple digital outputs, the Motorola DSR-4520X is the IRD to provide solutions for today’s needs and tomorrow’s opportunities. Digital outputs on the Motorola DSR-4520X include: serial digital interface (SDI) output, AES/EBU audio outputs and asynchronous serial interface (ASI) output. Digital data outputs include: Internet protocol data, isochronous data and asynchronous data. 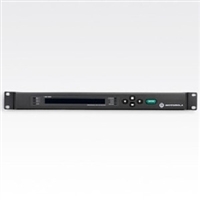 The SDI output provides 2 channels of embedded audio to allow easy routing of video and audio through a cable facility. The discrete AES audio outputs can be used in combination with the SDI video without the need for audio de-embedding equipment. Dolby® digital audio pass-through is available on both the SDI embedded audio and the discrete AES audio outputs. A complete MPEG-2 transport stream is available through the ASI output. IP data is output directly onto one of the 2 Ethernet connectors on the DSR-4520X. A transport stream consisting entirely of IP data can be output from the DSR-4520X Ethernet port. The Ethernet connections also allow remote command/control capabilities. Additional data delivery applications are supported through asynchronous (RS-232) and isochronous (RS-449) ports. 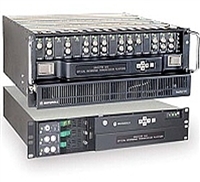 The Motorola DSR-4400MD is a powerful digital headend product, capable of simultaneous decryption of up to 24 services. Whether your application is to feed a 256 QAM channel or a 64 QAM channel, the DSR-4400MD is the answer. With the DSR-4400MD, you can output a full MPEG-2 multiplex at an information rate of 38.8 Mbps or 26.97 Mbps, depending on your needs. 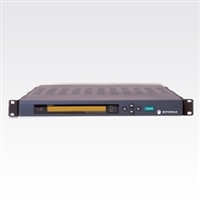 The Motorola DSR-4400MD comes equipped with industry standard interfaces that enable seamless connection to DigiCipher II IRT-1000/2000, MPS Remultiplexer and other head-end equipment for cable encryption and cable modulation. The ASI and DHEI inputs provide additional flexibility for the Motorola DSR-4400MD by allowing loop-through decryption capabilities when more than 24 services of decryption are required. They also provide a convenient mechanism for monitoring and troubleshooting the signal as it passes through the cable headend. The full range of DigiCipher II system symbol and code rates is supported, including the higher combined symbol rate of 29.27 Msps, rate 3/4 to enable 40.46 Mbps information rate transmission. With the lower SCPC rates, the DSR-4400MD becomes a flexible product that supports partial transponder utilization. 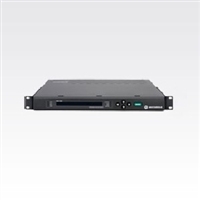 Packaged in a 1RU chassis, the DSR-4400MD offers local monitoring of a single service and the ability to step through the authorization and encryption state of each service. In the event of a transport stream fault, or loss of authorization for any of the provided services, the DSR-4400MD will trigger an alarm indication for the user. The DSR-6050 Integrated Receiver/Transcoder from Motorola brings revolutionary technology advances from a recognized leader in satellite program delivery. With the increased demand for HD services, programmers are looking for new distribution architectures taking advantage of emerging technology trends such as HD video processing, MPEG-4 AVC, and advanced modulation. The DSR-6050 is a next generation commercial satellite receiver, capable of transcoding MPEG-4 HD services into a MPEG-2 HD service output. 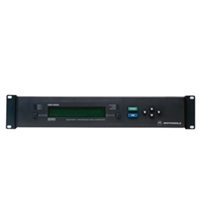 Packaged in a 1 RU chassis, the Motorola DSR-6050 comes equipped with industry standard output interfaces such as Gig-E and dual ASI outputs that enable seamless connections to head-end equipment. With advanced modulation support, the DSR-6050 supports 8PSK Turbo and DVB-S2 modulation.